The Cape Henlopen High School golf team recovered from its first two losses of the 2013 season with a 184-224 home course victory over Lake Forest on April 22, in very windy conditions. 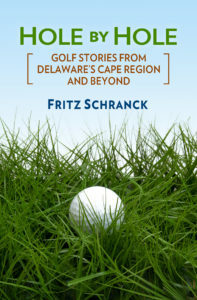 Head coach Claudio Smarrelli said a staffer at Rehoboth Beach Country Club told him that a member’s tee shot on RBCC’s first hole nearly reached the 10th hole green far off and to the left, thanks to the guesstimated 50 mph winds that morning. Smarrelli said it was little wonder that the two golf teams had the course to themselves for the blustery afternoon match. Mike DeStasio won medalist honors with his 44, improving on his match score average at the same time. Darren Branner and Tyler Reed tied for second best among the Vikings with a pair of 46s. This was Reed’s first varsity match. Mason Jones and Maddie Baptiste also tied for the Vikings’ fourth spot, each scoring 48. Baptiste’s match highlight was a tee shot to the par 3 fifth hole that almost went in for a hole in one, stopping a foot away. She made the birdie putt, also. Rachel Hagen also played for the varsity that day, posting a 52. The victory was a good recovery for the young squad, which lost two matches in two days to what may also be the two best Henlopen Conference teams. The Vikings traveled to Peninsula Golf & Country Club April 16, losing to host Sussex Tech 194-201. DeStasio led the Vikings with his 45, but none of his teammates could break 50 on the tough course. The Vikings improved significantly the very next day in their match against Polytech, but not enough to win against the talented Panthers. They lost at Wild Quail, Polytech’s home course, 173-189. Darren Branner scored a good 43, tying his competitor, and Jones posted a 45. DeStasio was third best for the Vikings with his 49, and Quincy Duckworth finished the team scoring with his 53. Sussex Family YMCA Branch Executive Director Terry Raspberry announced this year’s golf tournament fundraiser will take place May 13, at Rehoboth Beach CC. The popular event begins with a picnic lunch, followed by golf, a silent auction, and a banquet. The lead sponsor is Nickle Electrical Companies. Other sponsors include The Light House of Lewes, Schab and Barnett Attorneys at Law, Boulevard Ford-Lincoln-Mercury, First State Chevrolet and IG Burton BMW. As with the prior Y tournaments, the proceeds go to the YMCA Strong Kids Campaign, which provides financial assistance for kids to be part of the YMCA. For more information, including additional sponsorship opportunities, call the Y at 302-296-YMCA. The Rookery South is holding its spring demo day April 26, so if you are reading this column the day it appears, it’s not too late to make it to the Milton-area course to check out this season’s offerings. Club makers expected to appear include Titleist, TaylorMade, Nike, Cobra, Cleveland, Mizuno, Callaway, and Ping. For more information, call The Rookery at 302-684-3000. The Kings Creek Country Club Ladies 9-holers started their 2013 season April 15, with a low net round. Sue Eisenbrey won the day, followed by Chris Sullivan in second, Susie Shevock in third, and Mary Beth Merolla in fourth. Merolla also won closest to the pin, with a tee shot to 11 feet 6 inches on the eleventh hole. The group returned to action April 22, playing a format called 1, 2, 3 You’re Out. This time Sullivan took first place, with Susan Spence taking second place and Merolla in third.